Artwork created by Polk County students like this "Taking a Closer Look at a Meadow" piece is on display at the Womack Building in Columbus. COLUMBUS – Starting this week, artwork by Polk County students is brightening the halls of the Bryant H. Womack Building. The Polk County Board of Commissioners in February decided to display student artwork in the government building. The first pictures were hung this week. The display will be changed several times throughout the year and will include artwork from students who are homeschooled as well as in Polk County public schools. Everyone is encouraged to stop by and see the creative work of local students. Once a month, the Polk County Recreation Dept. hosts a free art class taught by one of the homeschool parents to other area homeschool students. A Polk County student created this colorful artwork in a Polk County Recreation Dept. art class. 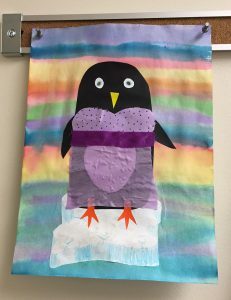 In February, the project was “Silly Chilly Penguin” and the students created scenes of penguins on ice floes with an aurora borealis in the background. 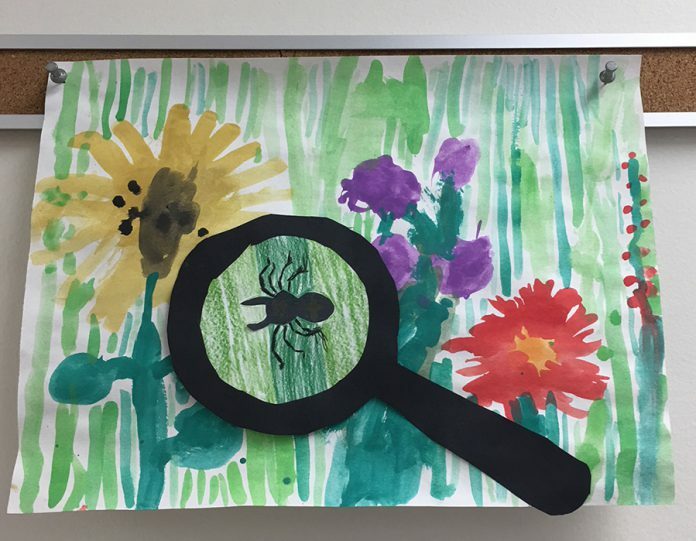 In March, the project was “Taking a Closer Look at a Meadow” in which students used field guides and a book about insects to create a spring scene with a magnifying glass and a critter of their choice. The next class will be at the beginning of May. For more information or to sign your homeschool student up, contact Laura Baird at lbaird@polknc.org. 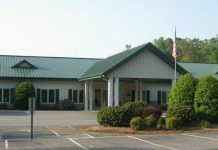 More about the Polk County Recreation Dept. can be found here.